The addition of the glass beads can be used to modify the ability to attract or 'stick' to water. Research Fellow Dr. Paul Molino said the silica colloids have a surface chemistry that allows particles to bind to each other, forming a stable coating, while also interacting with water in a manner that inhibits micro-organisms from attaching and populating. "We discovered that these silica colloids have remarkable, broad-ranging antifouling properties, with the ability to prevent adsorption of proteins, and attachment and colonisation of bacteria and micro-organisms," Dr. Molino said. 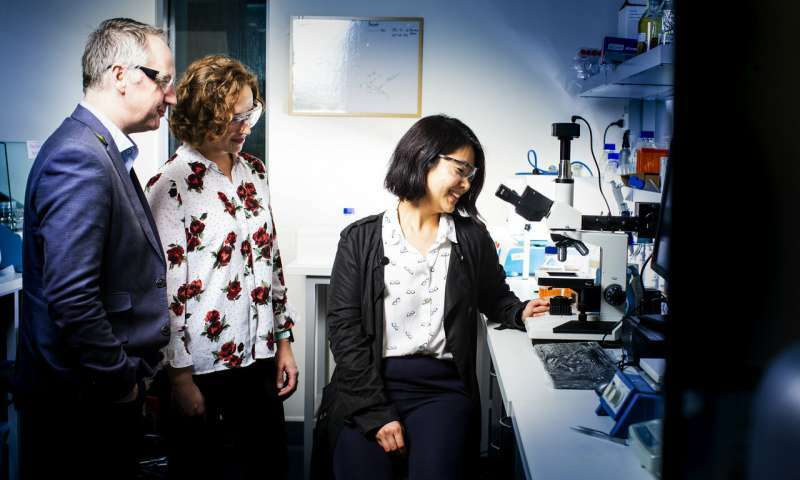 "They could help provide a simple, cheap and practical solution to producing antifouling systems, potentially on biomedical devices to prevent blood clotting, bacteria adhesion and possible infection, or for industrial applications. A key part of the work was using advanced high-resolution imaging and modelling to unlock the secrets of how the bonding works. They used atomic force microscopy to produce images of single particles on the surface to reveal the structure of layers and how they locked together. Collaborative work with Professor Irene Yarovsky's group at RMIT University in Melbourne predicted a strikingly similar structure using molecular dynamic simulations. "Knowing the mechanism is important for ensuring the effectiveness of the system, such as preserving the critical antifouling characteristics when combined with other materials and when creating surfaces," Professor Higgins said. "In future, we may also be able to design colloidal silica that mimics the antifouling mechanism to produce a wider-range of systems adaptable to different situations or environments. "By applying a holistic approach that combines experimental work with theoretical modelling, we were able to explain how the molecular-level interfacial structures lead to exceptional antifouling ability of these kinds of fouling-resistant systems. "As a result, the development of antifouling materials for a multitude of applications, including the modification of surfaces to prevent infection associated with implantable medical devices, or the build-up of slime layers on ships/recreational boats, is significantly advanced."